Herpes zoster is the disease that occurs when a latent chickenpox infection becomes reactivated in an older adult. It is also known as shingles. Chickenpox is caused by a herpes virus. However, it is not caused by one of the herpes simplex viruses that cause genital and oral herpes. Instead, it is caused by a different virus from the herpes virus family. 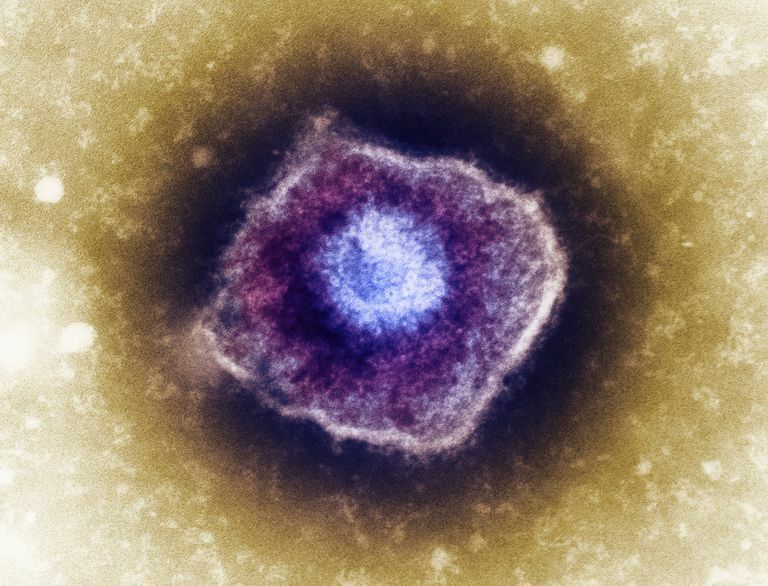 This virus is known as varicella zoster virus or VZV. Initial infection with VZV usually causes symptomatic chickenpox. The virus then goes into a latent stage. It remains dormant in the nerves of the body, just like other herpes viruses do. If activated at a later date, it can take the form of shingles, which is also known as herpes zoster. There are over one million cases of shingles in the United States every year. Herpes zoster causes the formation of a painful rash. This rash usually appears only on one area of the skin—an area supplied by a single nerve in which VZV has been reactivated. Sometimes the pain of herpes zoster can appear without a rash as well. Pain can last for a month or longer, particularly in older individuals. It can sometimes remain for over a year. This type of pain is known as postherpetic neuralgia. It is a chronic condition that can have significant effects on quality of life. In general, the younger a person is when they have chickenpox, the younger they will be when and if they have a shingles outbreak. That said, generally, shingles occurs in older adults. However, there are certain exceptions to this rule. One of the exceptions is that individuals with HIV are more likely to have a herpes zoster outbreak. In fact, herpes zoster in a younger adult is often seen as a reason to screen for HIV. Although VZV can be spread by skin-to-skin contact, it not usually considered to be an STD. Instead, it is a common childhood illness, and herpes zoster is a complication that can affect many adults. VZV is contagious, but you can't give someone shingles. Basically, that means that if you have shingles, you can pass the virus on to someone who hasn't had chicken pox. However, if you're around people who have already had chicken pox, you can't give them shingles. It is the fluid inside the bumps of the herpes zoster rash that are contagious. Once the rash has completely dried up and crusted over, you are no longer infectious to others. However, you may continue to have symptoms for a month or more. Shingles can also cause lead to other complications, including eye damage, bacterial infections, and Guillain-Barré syndrome. There is a childhood vaccine against chicken pox, but there is also an adult vaccine against shingles. It is currently approved for use in individuals over the age of 50. The vaccine, Zostavax, can significantly reduce both the incidence of herpes zoster and the extent of complications such as postherpetic neuralgia. If you think you might have shingles, it is important to visit a doctor to confirm the diagnosis. You should also be careful around children and adults who have never had chickenpox or who have never been vaccinated while you still have the shingles rash. If your family members and coworkers have already had chicken pox, they are not at risk. Gilden D. et al. (2011) Review: The Neurobiology of Varicella Zoster Virus Infection. Neuropathol Appl Neurobiol.37(5):441-63. Shapiro M et al. (2011) Update on Herpes Zoster Vaccination: a Family Practitioner's Guide. Can Fam Physician. 57(10):1127-31. Did You Know That Many STDs Can Also Infect Your Eyes?